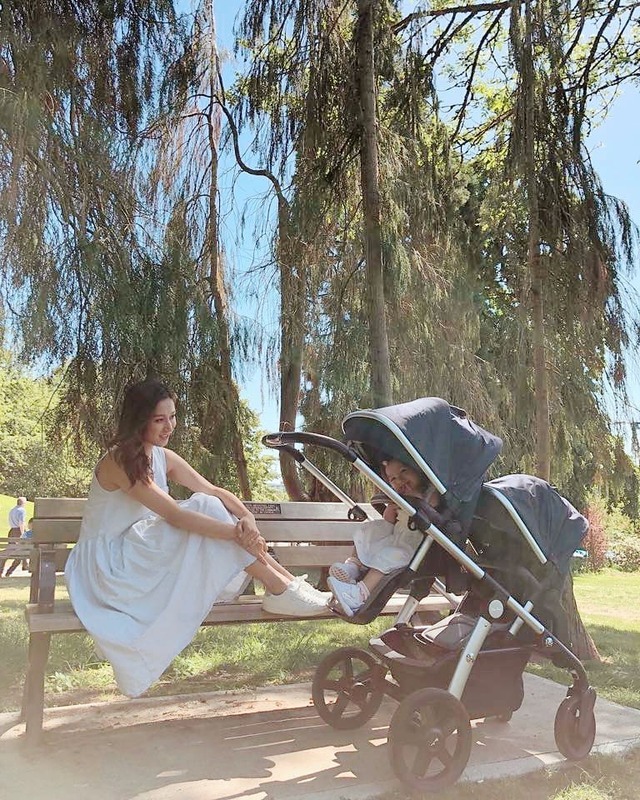 New mother Linda Chung (鍾嘉欣), who is currently pregnant with her second child with husband Jeremy Leung, has returned to Canada after a hard week of work in Hong Kong. The 34-year-old, who is expected to deliver this fall, shared on social media that she had just taken her two-year-old daughter Kelly to the park, sharing tidbits of her life with the fans. Linda shared a picture of her wearing a blue summery dress, sitting on the park bench as she watched her daughter. “I guess this is what life’s gonna be like in a couple of months,” she said. The baby carriage Kelly was on has another baby seat, making it clear that Linda is already prepared to welcome Kelly’s younger brother or sister. Check out the adorable pictures below! I love when toddlers and babies smile and their eyes curve. It’s so cute! So sad that she will not Come back on tv drama. Like to see her in BTRC 2 then Nancy Wu. She is one of the three fadans “charmaine And tavia” who has those romantic chemistry with Stephen. Gorgeous photos of Linda and Kelly! Vancouver’s beauty has been spectacularly showcased in gorgeous sunny weather for the past month. That’s prob Kits, ericho or Spanish Banks beach … all linked. Possibly English Bay, but less likely. The willowy park backdrop – likely Stanley Park. She’d be pretty hard to spot – in this city of many Asians from everywhere. And Asian moms who look and dress like that here, a dime a dozen.